On 28th January at 0100hrs in the moonlit early hours of the morning (after a ride on the last train of the night to Warnbro Station and no sleep), I set off on an attempt to run 53km to St Georges Terrace in the Perth CBD. I invited scores of friends to come with me, and while several of them including Dave (whose idea it originally was), considered coming, none of them showed up on the night. I was not that surprised, although I was hoping someone would show up, as a bit of company on a night run is very welcome. Not to be, so I set off on an attempt at the longest run I have ever tried. I ran into some early troubles with my intended course proving to be a bit scary, and decided to stick to roads and bitumen paths instead, and made up a new course on the spot choosing to go via Baldivis instead of Rockingham and Wellard/Kwinana in the absence of any company. Then about 1 hour into it in Baldivis I had a big need to go to the toilet. 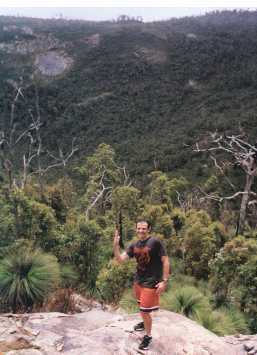 I had toilet paper in my pack, which was a "lifesaver", but it was a tough early obstacle that wasted a lot of time. Then got going. 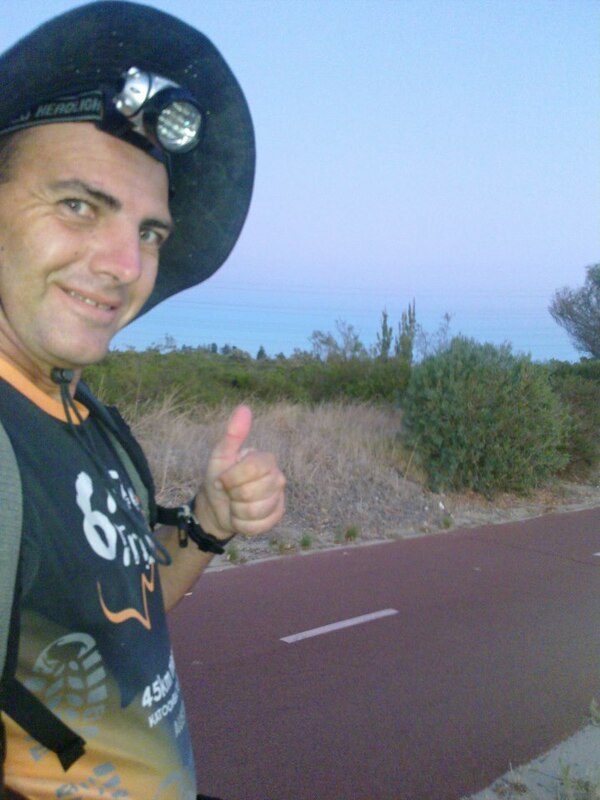 Ran well for awhile, although had a lot of encounters with spiderwebs which were hard to see in the moonlight between Baldivis and Anketell Rd. During this period I started to have big problems with heel soreness, and I strongly considered aborting the run altogether at Kwinana only about 3 hours into it. However the prospect of sitting at Kwinana Station for a few hours waiting for the first train in the cold wind was not an attractive one, so I decided to try and run to Anketell Rd, and try and cope with the injury build some speed in the next 3km or so. I figured if I was reduced to a walk, at least I would have used up 2 hours and kept body temperature up a bit by the time I retreated back to Kwinana. If things went well I would try and push on another 8km or so to Cockburn Central station which would have me within 10km of home. Things did go well, and when I had covered around 27km in 4-5 hours I stopped for a break to take a few photos text my wife, and post on facebook. 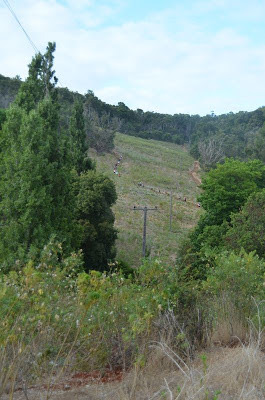 I was able to sustain a decent pace to the point I made it to my drinks stash by just over 5 hours, and after refueling I decided maybe I could go the whole way, or at least try and get as far as Murdoch train station. Reassessed at Murdoch, as the temperatures heated up, and I knew I needed to get through the last section in about 2 hours to finish by 10am or so. Was restricted by the heel soreness and getting hard to keep going due to general fatigue, but I pushed on, ignored the pain, and maintained a decent pace. Ran on sand and grass whenever I could get off the bitumen. It was an awesome euphoric feeling reaching my "finish line" in the city. struggled into a Dome Cafe, got some money out and ordered pineapple juice and potato wedges for breakfast at 10am after 9hrs and 4min on the 53km course. There was a few cyclists in lycra there at the cafe, and in my 6 foot top I felt like I belonged, although I didn't sit too close to the people sipping lattes in suits, and nice dresses, as I figured I was pretty sweaty... Epic experience, which had a lot of obstacles along the way, and I hope to have another go later and try and get it done in under 7 hours next time, and hopefully a few friends will come for a ride or a run next time at least part of the way, although it was still a lot of fun solo. 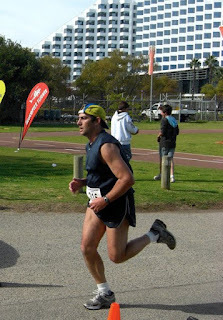 Busselton Half Marathon on 9th February 1hr 51min 58secs. Next up I visit an "old friend" for many decades of my life; "THE GORGE"!!!!! Looking forward to getting back there... Update; 17/2/13; Had a glorious and at times tough 3 hrs with the Kangaroos, the Monarch butterflies, the Cherrynose cicadas, the red tailed black Cockatoos, the Phatties, and managed to get rather geographically embarrassed on the trails of the Gorge! Twisted ankle and sore heel, and getting absolutely smashed by the first big hill was all part of the trails paradise experience. Have to see how I pull up in the next few days as to whether its hiatus or game on for racing, but so good to go visit one of my all-time favourite places for decades. That 53k was an epic adventure! Not too bad on the half considering the super-fast start. Would like to borrow that 12:47 for a 3000m race! Haven't broken 13 yet this season.